Get your computer hooked up by a professional with skills to do the job right, the first time. Set your new computer up so that it runs quickly, simply, and smoothly. Get back that nimble, useful, and fun computer that you remember. Set up a simple, effective backup system that won't let you lose your files. Find the remnants of the things that have gone missing, and bring them back to life. Reorganize the storage space in your computer so that it can perform more quickly and efficiently. Get the most up-to-date operating system, or reinstall your system after a crash. Get your new software installed and customized to your individual needs. Setup your own private account, and learn how to use email to stay in touch with those you love. Flush out those nasty invaders and nurse your computer back to health in no time. Get the right smart phone and learn how all of its features work. Choose and configure our new tablet, and learn how to install and use applications. Get all your devices online and synched up, quickly and painlessly. Set up a fast, powerful, secure wireless network for you and your family. Analyze your needs so that you upgrade to the perfect equipment. Get familiarized with your computer so that you can make the most out of it. Geek-Aid also offers monthly computer maintenance agreements. 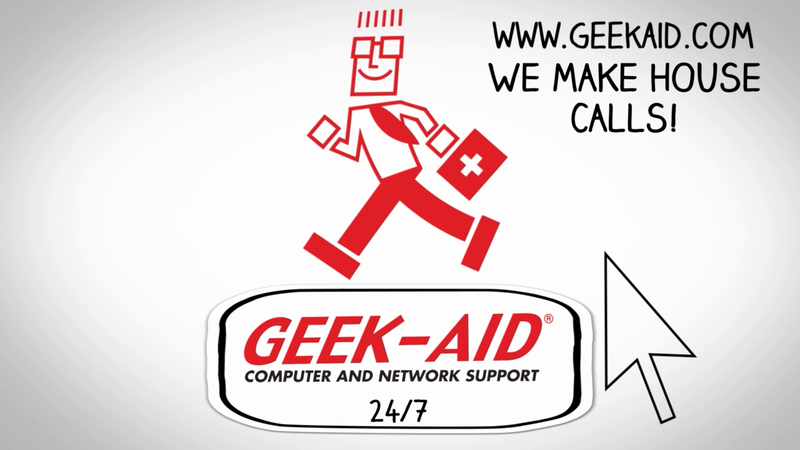 At Geek-Aid® we pride ourselves on providing a wide variety of computer support services and back them up with world-class maintenance. Our geeks are knowledgeable, professional and enthusiastic about technology and getting it to work for you. We offer a variety of maintenance and upkeep plans with 24-hour emergency support so that everything we set up runs as well down the line as it does on day one.